Debaters can speak 300 words per minute...but no one cares. Imagine a football game whose rules, points and plays cared nothing for the viewer, and were so complicated that only its referees were able to keep up, and even their judgment was doubtful. That’s modern high school debate, a chaotic mess that is nearly impossible to watch. Read the accompanying article at The Wall Street Journal. That view probably comes as a surprise from someone like me. I have been coaching debate for over 20 years, but I also publish source material for several debate leagues. This has given me a unique perspective into the problems in the great debate community. I want to address some of the big ones in this blog post. This is a long post that covers some heated “debates” among debaters and their coaches. But if you’re looking in from the outside — as I’m sure thousands of WSJ readers did with the video above and the article it complements — you should come away understanding that debate is an incredible skill that should be impacting lives nationwide. The trouble is, it isn’t. Debate, in some regions and leagues, has been hijacked. Most people have something simple in mind when they think of academic debate: Students study resolutions, gather research, develop cases and opposition material, and enter tournaments hoping to persuade their judges and win trophies. But yesterday’s The Wall Street Journal article reported something totally different. It was shown to be a game of foolish, rumbling nonsense. The goal was to “to squeeze in more debate points,” as if the sport was measured on a scoreboard. The title speaks for itself: How to Win a High-School Debate: Talk Like a Cattle Auctioneer. I received the print version yesterday morning, and I noticed the clever change: “IfYouCanUnderstandThisYouMightBeAHighSchoolDebater,” spaces purposely omitted. In the accompanied video above, the interviewed student made it a game to read 300 words per minute, along with a frustrated F-bomb laughed in for show. The community appears to be filled with former debaters who are the only ones that can keep up with the chaos. I suppose you’re asking a very good question: How is this considered debate? Again, my answer is that it isn’t. The sport should be one of candor and intelligence, not slang and scorecards. Logic and reasoning should drive discourse and clash, not “kritik” theory that attempts to marginalize opposing views. And debates should be open events that anyone would enjoy watching, not a community of inbred speed-readers who think reading as many evidence cards into a round is the sole objective to winning. You’re right: The Wall Street Journal was not showing you debate. They display what high school debate has become in some parts of the country and regional areas of the largest leagues, but it is far from what debate should be. I attend three national tournaments every year, as well as countless number of state, regional and national qualifiers. I travel coast-to-coast, sometimes setting up a Monument Publishing vendor booth, judging rounds and talking with the leaders of diverse communities. Academic debate coaches are the best people in the world who have huge hearts for their students and believe debate will give them the tools that will launch them into life. But here’s the common problem in the debate community: Programs remain small, underfunded and reserved only for the “smart kids.” Community neighbors love to spend their Friday nights watching high school football or basketball games, but never the Saturday morning debate rounds. The activity itself has walled itself from the rest of the academic world, for reasons that WSJ cited. There is hope. I see some communities flourishing, and the kids are learning incredible skills of persuasion. I have identified three major problems with the communities that are failing, and if schools and leagues make just a few adjustments to their community standards, academic debate can return to its influential and educational platform. Let me bring you into the world of high school debate, identify three problems, show you three simple solutions, and identify the community that is doing debate right. The focus of the WSJ article was “spreading” — a practice derived from “speed” and “reading” — which is a technique used to stack up an unanswerable amount of evidence against your opponent. Students are taught to read 300 words per minute. No one can understand the delivery, but that doesn’t matter. As long as they read the evidence into the round, the judge counts it as good and they move on. This is a members-only technique on how to handle spreading. I opened it up for all for the purpose of this article. I’m not sure what coach thought this was a good idea, because it’s not. Communication — explanation, analysis, persuasion — takes a backseat to reading fast. It is quite puzzling to any outside observer that this is considered (by some) to be a winning strategy. I’ve spoken with spread advocates (virtually all of them are former high school debaters who are now on college teams), and they will typically insist that this is a skill that has helped them in life. They think faster than a bullet, and they spend most of their time outside of a debate round doing the analysis that anti-spreaders claim is lost. In reality, no analysis is going on during the debate, which is unfortunate. In the tournament round, two significant outsiders are lost. First, the judge. Unless they are a coach who knows what the evidence says, they don’t have a clue what is being debated. The evidence doesn’t communicate anything, and if the student doesn’t slow down to explain it, the judge will be left rendering a decision based on a guess. A decision is not made on the argumentation, but on bias. The winner is whoever appears to have won, because the judge certainly doesn’t come to a conclusion from the arguments. Another significant loss is the audience. The only ones enjoying the clash are the debaters themselves, running through the arguments without any concern of being persuasive. It’s laughable, and the debaters know it, as the WSJ article quoted one of the students, “My mother, actually, she can’t even be in the room when I’m spreading because she would laugh too hard and it would distract me.” If your own mom can’t watch, then you’re doing debate wrong. There are two solutions to this problem. First, coaches need to stop coaching speed debate. Instead, coach the students to zero in on the judge and adapt to a layman’s understanding of the debate topic. This is a change of paradigm for those who have been trained to “squeeze in more debate points”: Champion debaters must persuade their judges, not overwhelm them with evidence cards. The second solution has to do with the “judge pool,” those judges that typically serve at local tournaments. I attended a tournament last week for a league that I usually do not participate, I was the sole community judge. Everyone else were coaches and former school debaters. That’s a huge in-breading problem that I’ll get to in my third point. Students and coaches sometimes come up with what I call “gotcha techniques,” clever maneuvers to avoid the debating that goes on in a good debate round. They often stem from a good idea, but then get exaggerated into a hyper-popular technique that ruins a good debate. Spreading is perhaps the most obvious technique, likely started with the need to read evidence quickly, but grew to the ridiculousness in the video above. That will lead to nuclear devastation and destroy the planet. For heaven’s sake, the case was on bilingual education. And the negative team tried to convince me that it would lead to the decimation of the human race. They didn’t win, as long as I was the judge. But most disturbing was that some judges would have given them the win. I wholeheartedly disagree. Such technique ignores the incredible depth of reasonable thinking. Rather than training students to take on the resolution (look, there are problems with federally mandated bilingual education, but nuclear holocaust is not one of them), they dilute it to “gotcha” techniques. Do you understand this statement? He read it twice as fast as anyone could understand, and I suspect this is the point. Quickly confuse, then claim the win. My observation over the decades of debate coaching, judging, and teaching (across several leagues, formats, and states) is that few people — very few — are in favor of the kind of debate that the WSJ video emulates. The comments under their article (if you are a subscriber like I am, you can read them for yourself), show that there are plenty of former debaters agreeing with my analysis that gotcha techniques ruin debate. In fact, I know many high school debate coaches, and I struggle to recall one who arguably can say they enjoy what debate has become. Even the former coach I met in January — someone who goes along with the culture of debate and allows nuke disads — had to admit the ridiculousness of the argument. This is a huge problem, but not unsolvable. The solution to this is fairly simple: teach logic and reasoning first. There are plenty of strategic techniques, but they must not take a back seat to rational, truthful, reasonable argumentation. Once students build a basic foundation of structure (for the students in the WSJ article and the movie “Resolved,” basic 4-point refutation would be a good start), they are able to venture into strategies to win debates. Not all leagues and debate formats are like this. I’ll get to some in a minute, but I have one more problem to cover. If the only people who enjoy your activity are the ones who live and breathe the skill, you’re promoting an activity that will die out. In other words, if you need to be an expert in so-called debate theory to observe the activity, you’re doing debate wrong. I call this problem the “inbred culture,” meaning only experts who have been raised through the program are able to jump in. This leads to small programs that will not grow, and the activity itself will diminish. I propose a couple of solutions. First, stop paying your judges. This will inherently cut down on alumni judges and the need to exploit the underpaid coaches who are “working for free.” The gap would be filled with parents, community leaders and lay people who would negatively ballot trickery and sophistry. Tournament directors might think they won’t get enough judges, but some leagues thrive with an all-volunteer judging pool (more on that in a minute). This would force debaters to drop the ridiculous gimmicks and actually communicate and persuade their judges. Rather than dropping F-bombs and reading incomprehensibly, candor and respect would return to the lectern. 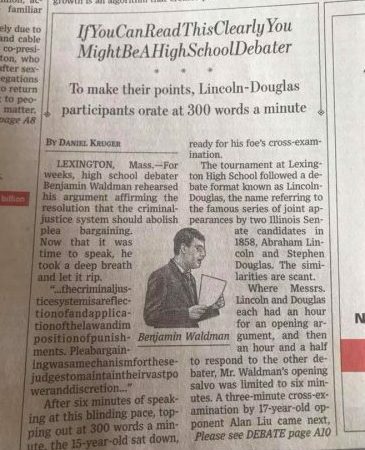 This WSJ article exposed some major problems with some regions of high school debate. I hope these don’t turn you off to the activity. There are several communities serving as an oasis to spreading, gotcha techniques and inbred cultures. But there is one I’d like to highlight in this blog post. They have assembled their own leagues and are a vibrant community of debaters that can be gleaned from. My publishing company’s membership site (MonumentMembers.com) creates source material for three leagues: NSDA, NCFCA and Stoa. The first is the National Speech and Debate Association (referenced in the WSJ article) and clearly the largest league by about 50:1. The latter two are exclusively homeschool leagues, NCFCA and Stoa. Though homeschoolers may compete in NSDA, most have found the homeschool leagues to be much, much more enjoyable. Speed debate is not forbidden by the homeschool leagues, but is definitely not a winning strategy. The same is true for whacky “nuke disads” or kritiks. They mostly draw a rolling eye and a losing ballot from the judge. The judge pool stays fairly consistent with 1/3 parents, 1/3 alumni, and 1/3 “community judges” (people who volunteer to judge with little or no previous experience). As you see, alumni are still welcomed and respected, but they don’t drown the pool with sophist trickery. Which is what I want to see for all. We need to get debate back on track.